Odin (/ˈoʊdɪn/; from Old Norse: Óðinn, IPA: [ˈoːðinː]) is a widely revered god in Germanic mythology. In Norse mythology, from which stems most surviving information about the god, Odin is associated with wisdom, healing, death, royalty, the gallows, knowledge, war, battle, victory, sorcery, poetry, frenzy, and the runic alphabet, and is the husband of the goddess Frigg. 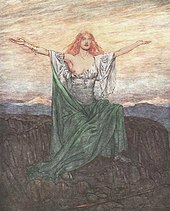 In wider Germanic mythology and paganism, the god was known in Old English as Wōden, in Old Saxon as Wōdan, and in Old High German as Wuotan or Wōtan, all stemming from the reconstructed Proto-Germanic theonym *wōđanaz. In Old English texts, Odin holds a particular place as a euhemerized ancestral figure among royalty, and he is frequently referred to as a founding figure among various other Germanic peoples, such as the Langobards. Forms of his name appear frequently throughout the Germanic record, though narratives regarding Odin are mainly found in Old Norse works recorded in Iceland, primarily around the 13th century. These texts make up the bulk of modern understanding of Norse mythology. Meanwhile, Ybor and Aio called upon Frea, Godan's wife. Frea counselled them that "at sunrise the Winnil[i] should come, and that their women, with their hair let down around the face in the likeness of a beard should also come with their husbands". At sunrise, Frea turned Godan's bed around to face east and woke him. Godan saw the Winnili and their whiskered women and asked, "who are those Long-beards?" Frea responded to Godan, "As you have given them a name, give them also the victory". Godan did so, "so that they should defend themselves according to his counsel and obtain the victory". Thenceforth the Winnili were known as the Langobards ('long-beards'). Two of the 8th century picture stones from the island of Gotland, Sweden depict eight-legged horses, which are thought by most scholars to depict Sleipnir: the [[Tjängvide image stone|Tjängvide image stone]] and the Ardre VIII image stone. 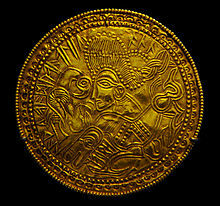 Both stones feature a rider sitting atop an eight-legged horse, which some scholars view as Odin. Above the rider on the Tjängvide image stone is a horizontal figure holding a spear, which may be a valkyrie, and a female figure greets the rider with a cup. The scene has been interpreted as a rider arriving at the world of the dead. 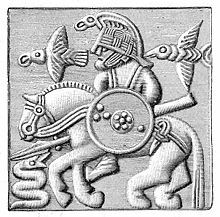 The mid-7th century Eggja stone bearing the Odinic name haras (Old Norse 'army god') may be interpreted as depicting Sleipnir. 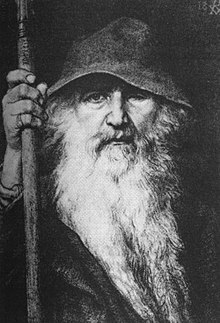 Odin is often mentioned as one of the early inspirations for modern European and US Christmas traditions (see Santa Claus). Works of modern literature featuring Odin include the poem Der Wein (1745) by Friedrich von Hagedorn, Hymne de Wodan (1769) by Friedrich Gottlieb Klopstock, Om Odin (1771) by Peter Frederik Suhm, the tragedy Odin eller Asarnes invandring by K. G. Leopold, the epic poem Odin eller Danrigets Stiftelse (1803) by Jens Baggesen, the poem Maskeradenball (1803) and Optrin af Norners og Asers Kamp: Odin komme til Norden (1809) by N. F. S. Grundtvig, poems in Nordens Guder (1819) by Adam Oehlenschläger, the four-part novel Sviavigamal (1833) by Carl Jonas Love Almqvist, the poem Prelude (1850) by William Wordsworth, the poem Odins Meeresritt by Aloys Schreiber [de] set to music by Karl Loewe (1851), the canzone Germanenzug (1864) by Robert Hamerling, the poem Zum 25. 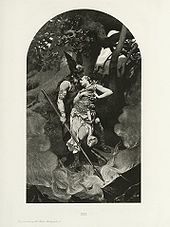 August 1870 (1870) by Richard Wagner, the ballad Rolf Krake (1910) by F. Schanz, the novel Juvikingerne (1918–1923) by Olav Duun, the comedy Der entfesselte Wotan (1923) by Ernst Toller, the novel Wotan by Karl Hans Strobl, Herrn Wodes Ausfahrt (1937) by Hans-Friedrich Blunck, the poem An das Ich (1938) by H. Burte, and the novel Sage vom Reich (1941–1942) by Hans-Friedrich Blunck. Odin makes an appearance in the mid-1990s Disney animated TV series Gargoyles, in its second-season episode "Eye of the Storm," as one of Oberon's children – even riding a four-legged version of Sleipnir at one point in the story; his conflict with Goliath is settled amicably for both, resulting in Odin regaining his right eye, preserved earlier within the series's storyline as the Avalon-crafted "Eye of Odin" bejeweled and enchanted Third Race artifact. Despite not making a physical appearance, Odin is frequently referenced in God of War as a driver of the game's events. Seeking to conquer Jotunheim, the realm of the giants which was severed from the nine realms by its inhabitants, Odin sends his son Baldur and grandsons Modi and Magni to find Kratos and his son Atreus in order to stop them from reaching Jotunheim, which he had foreseen. He also has a large number of semi-invisible ravens which he uses to spy on Kratos, and even blocks the player from traveling to certain realms, such as Asgard. According to Mimir, Odin is obsessed with finding Jotunheim because he desires to rule all of the known world and is willing to do anything to ensure his dominance, even placing a spell on his estranged wife Freya so that she cannot leave Midgard. ^ "Odin". Random House Webster's Unabridged Dictionary. ^ a b Orel (2003:469). ^ a b c Birley (1999:42, 106–07). ^ a b c Griffiths (2006 :183). ^ a b Pollington (2008:46). ^ For example, Herbert (2007 :33), Pollington (2008 :18). ^ a b Griffiths (2006 :174). ^ a b Faulkes (1995:33). ^ a b Hollander (1964), p. 7. ^ Hollander (1964), pp. 7–8. ^ Simek (2007:164) and Lindow (2005:187). ^ a b Petersen (1990:62). ^ a b c Pluskowski (2004:158). ^ Roskilde Museum. Odin fra Lejre Archived 2010-06-26 at the Wayback Machine and additional information Archived 2011-07-19 at the Wayback Machine. Retrieved Nov 16, 2009. ^ a b Davidson 1990, p. 147. ^ Vries 1970b, pp. 89–90. ^ Polomé 1970, p. 60. ^ Gimbutas & Robbins Dexter 1999, p. 191. ^ Turville-Petre 1964, p. 103. ^ Polomé 1970, pp. 58–59. ^ Vries 1970b, p. 93. ^ Vries 1970b, pp. 94–97. ^ Weisman, Greg (May 21, 2007). "Gargoyles – Ask Greg Archives – Odin – 'This day in Gargoyles' Universe History...May 21st...1996'". s8.org. Station Eight. Retrieved August 17, 2017. Goliath challenges Odin, and the two 'gods' do battle. Goliath comes close to killing Odin, Elisa, Angela and Bronx, but comes to his senses at the last moment and removes the Eye. Odin places it back in his empty eye socket, neutralizing the Eye's transformative powers. 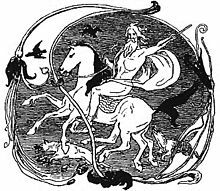 Reconciled with his former opponent, Odin rides Sleipnir up the Rainbow Bridge at sunrise. ^ "Ian McShane cast in Neil Gaiman TV adaptation American Gods". ^ "無双OROCHI3 公式サイト". 無双OROCHI3 公式サイト (in Japanese). Retrieved 2018-08-13.